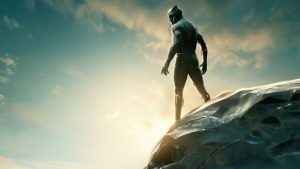 Recently I’ve been thinking about Wakanda and the Black Panther movie, and because of my highly developed “black consciousness” I have a need to do some small measure of review. Primarily it struck me – mostly at the end of the movie and it’s been striking me ever since – that this story is not about being black, or white, or yellow or green, or any colour in between, but it’s about being human. Most of all, for me, at the core it’s about being a better kind of human. There is this hidden kingdom that has so much going for it, so much good stuff, which sends out agents into the outside world. Its “war-dogs” are out there but the real Wakanda is closed off to the outside world – they guard their borders, and they don’t share their tech, it’s only for the insiders. In the story, the old king has bred a monster through his inclusivist-only policy, his policy of secrecy and cutting off access to Wakanda from the outside world, and that monster comes back to bite. His heir, his son, takes over when the old king dies, and the first serious challenge to his leadership comes from within Wakanda – comes from the champion of a tribe within Wakanda that are somewhat outsiders, from the tribe that doesn’t quite buy in. T’Challa defeats his challenger, and is magnanimous in his victory, such that when he later needs some help that is exactly where he gets it. Then he embarks on a mission – a white supremacist has stolen some of the Wakandan mineral wealth, as well as an artefact made of Vibranium, and the new king vows to get it back. So off he goes with his companions, and partly the mission is revenge-driven, because of what this enemy had done to the family of a close friend. However, in our story, the revenge aspect is thwarted by a member of the team that they’re up against in this fight who is actually Wakandan. This is a man who was left behind in the outside world as a child by the old king, because of his desire for secrecy and protecting all that Wakanda has – and this renegade, knowing about the desire for revenge, kills the supremacist and brings his body to Wakanda’s border as his sort of ticket in. And he challenges the new king now. Now we have this hate-filled, black-empowerment, world-dominator kind of warlord challenging… and he takes the king down! But fortunately, that’s not the end… because T’Challa didn’t die. And, raised “from the dead” as it were, by a life-giving elixir, he fights back. Of course there are protagonists on both sides – the different aspects of the equation are made clear. On the one side you have the Killmonger’s crew, including the tribe that wanted revenge so badly, and on the other side the ones who seek the true king because they know his character – they have seen him extend grace and mercy so they follow him and they fight for him… and they overcome. He declares that Wakanda “… will no longer watch from the shadows”. He speaks of their bringing to the rest to the world all that Wakanda has to offer, and of course we know just what that is, but there is this question that is raised by one of his listeners, of – “what can this nation of farmers have to offer” – and T’Challa just looks around at his companions with a small smile on his face. Now – as Kingdom People – do we know what that smile means, for us? Do we know what we have to offer the rest of the world? Are we ready to come out of our enclave and bring all that we have to the table? Are we ready to steward the infinitely precious resource that we have and are, in Christ, and share with the rest of the world? Those are the questions that come to me out of Black Panther, and I think there is lots of other stuff that can be gleaned out of it – a classic storyline really. I loved all the tech, and even the bullets flying, the airships, and the rhinos… but there is much to be learned out of it, if we are prepared to take those lessons. For me – it is a lesson about stewardship of the treasure that we have in the Kingdom of God, for the whole world. And if you have watched the movie – did you notice that the villains in this story, the villains in this movie – were first of all the white supremacist, yes, but secondly, it was the hate-filled black man who wanted to dominate the rest of the world? I think there is a big lesson for all of us there too.